Hello, lovelies! I’m Christina, a food and lifestyle blogger from Tampa, FL. I’m all about living a healthy lifestyle with indulgence in moderation, and enjoy spreading that message on my blog, The Blissful Balance. I’m down for a long run or a tough workout class, a green smoothie or downtown street food, and love capturing it all with my Canon. 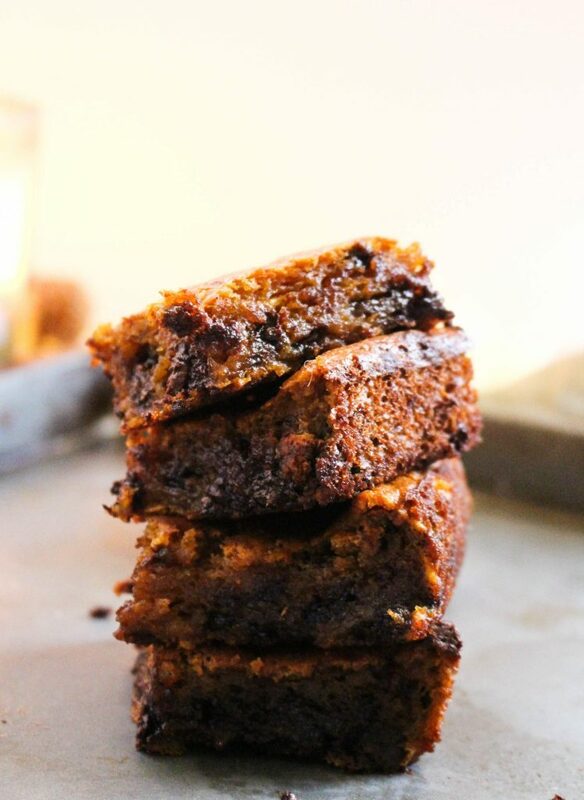 Today I’m sharing a Fall favorite, with a few healthy tweaks. I hope you enjoy! Oh, how excited I am that Autumn is upon us. Football is consuming my television. The Bath & Body Works collections have transformed from beachy and refreshing, to warm and cozy. The leaves are a-changin’, the temps are a-droppin’. Okay, who am I kidding? I live in Florida and it’s still in the 90’s outside. BUT, that’s what pumpkin is for, right? Cook or bake any dish containing pumpkin and BOOM. You get that “Fall feeling”. My favorite feeling that results from my favorite time of year. I love to cook or bake with pumpkin. It can be overbearing at times, in my opinion, when mixed with strong spices like nutmeg (I’m looking at you, PSL), but when the right amount is used and that perfectly subtle, pumpkin flavor emerges on your tastebuds… fa’getta bout it. One thing about this recipe is it highly varies on the strength of your oven. Additionally, it depends on how big of a gooey factor you prefer. 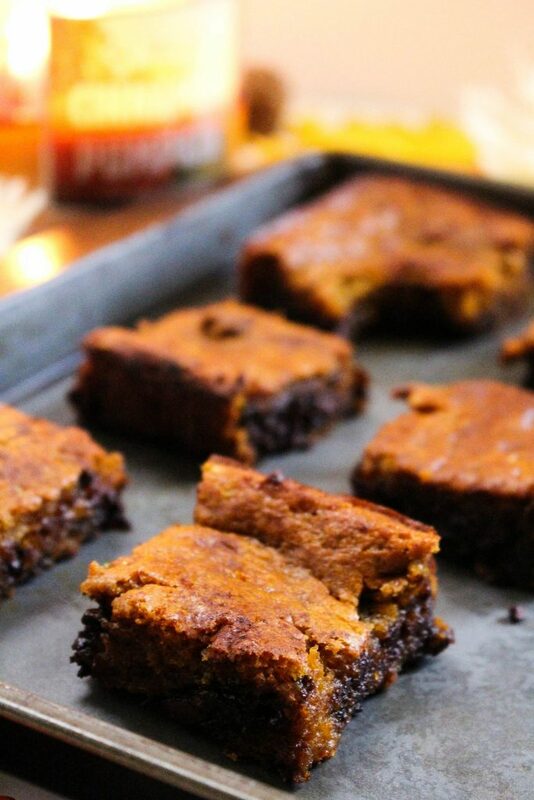 I love me some gooey brownies, so of course, I don’t discriminate against blondies. Being that pumpkin puree or pumpkin pie filling is so soft and smooth, it really adds to the goo factor. Pre-heat oven to 400 degrees and grease an 8x8 baking dish. Combine flour, protein powder, sugar, baking soda in a large bowl. Add yogurt, eggs, vanilla and pumpkin puree to a smaller bowl and whisk together. Add wet ingredients to dry and mix well. Pour batter into baking dish and place in the oven. Bake for 35 minutes. Again, depending on strength of your oven, it may be longer. Keep checking and piercing with a knife or fork to ensure doneness. Enjoy with a giant scoop of vanilla ice cream. Oh. wow. these look unreal. Christina nailed it! 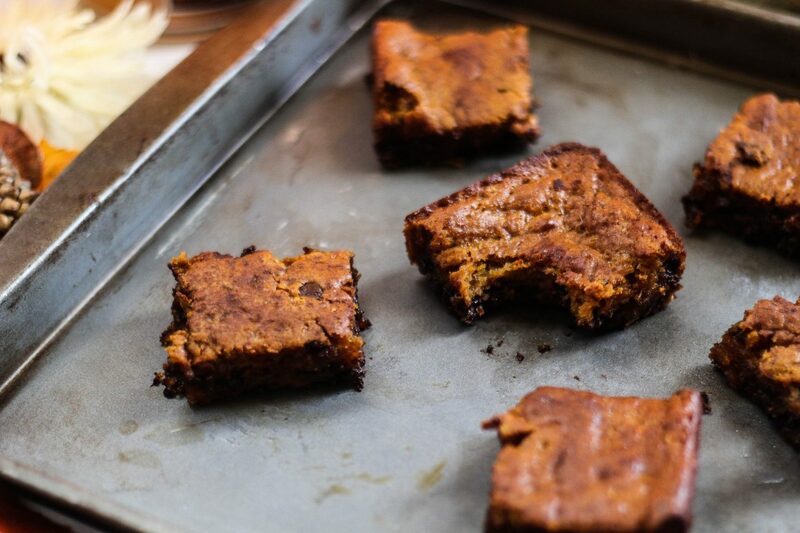 Thanks for the DREAMY pumpkin chocolate chip blondies sista! Hi – I have all ingredients except for vanilla protein powder. Are there any substitutes/is it 100% necessary for this recipe? Do you think subbing coconut flour for normal flour would work here? Or do you think it would make the taste off?